Our do it yourself help pages are here to help you better understand how easy it is to work with aluminum products. We sell and install these products in the Mesa, Arizona area. 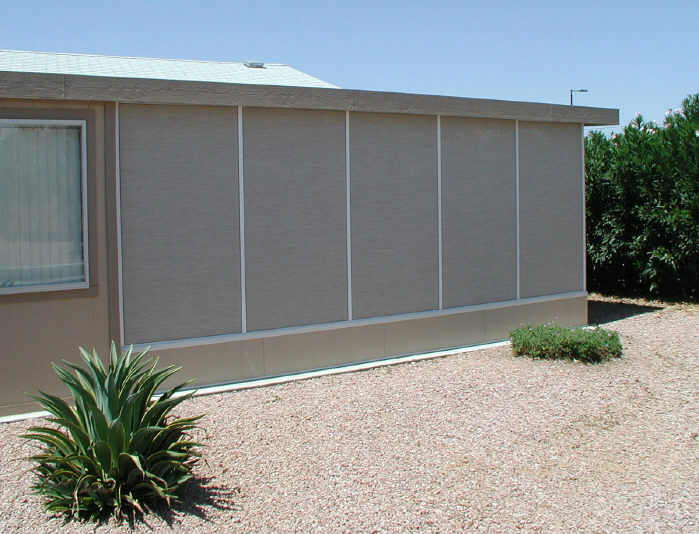 We spend a great deal of time in the field installing aluminum awnings, window awnings, sheds, decks, aluma lattice products, screen rooms and building shade screen structures. We have for over 30 years. We have gained a lot of knowledge in that time and being out there on a daily basis we keep up on all the new products and ways of using them. In this section we hope to give you all the information you need to install aluminum products. If you don't find all the information you are looking for here please contact me for some expert advice. Ordering aluminum products can be done here. The Alumawood installation pages are a good place to get started working with aluminum products. Building a patio cover is a good place to start if you are considering using aluminum for your patio or carport cover. It gives a good overview of the installation process. This page is followed by a page of photos and step by step tips to further illustrate the simple skills used to assemble aluminum awnings. We have also started our awning faq section to help answer all the questions you may have before starting your own project. Awnings FAQ and Awning Questions and Answers are two pages full of answers. Aluminum window awnings are one of our most popular items. They are easy to ship, they look great when they are installed and they are so easy for the do it yourselfer. See pictures of the process from start to finish at window awning installation. Lattice patio covers and shade screens are a couple of more do it yourself projects we have covered in this section.